Prime Minister Sheikh Hasina today paid homage to Father of the Nation Bangabandhu Sheikh Mujibur Rahman at Tungipara of Gopalganj on the occasion of installation of her government for the third consecutive term. The prime minister paid tributes to Bangabandhu by placing a wreath at his shrine here this afternoon. A smartly turned out contingent drawn from the three forces gave an honour guard to the prime minister, while the bugle played the last post on the occasion. Bangabandhu’s younger daughter Sheikh Rehana was also present. 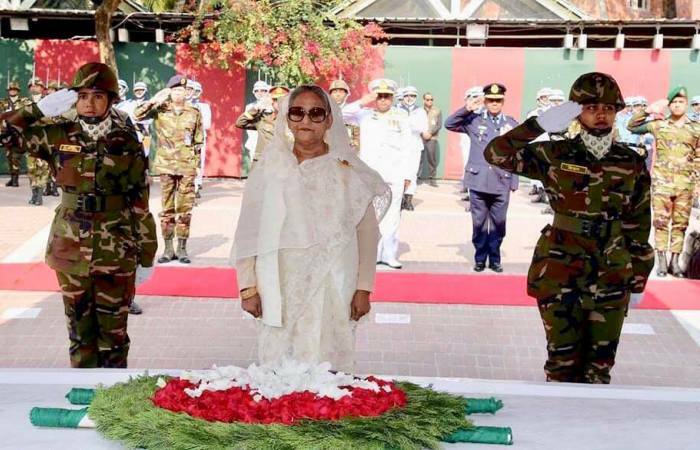 Later accompanied by the cabinet colleagues and senior Awami League leaders, Sheikh Hasina placed another wreath at Bangabandhu’s shrine. She also joined a milad and doa mahfil held on the Bangabandhu’s Mausoleum premises. Advisers to the prime minister, AL parliament members and central leaders, cabinet secretary, secretaries concerned to the prime minister as well as senior civil and military officials were also present on the occasion.